Gear Circle: How long can I use my Samsung Gear™ Circle before needing to charge it? Your fully charged Samsung Gear™ Circle battery can provide nine hours of play time, 11 hours of talk time, or 300 hours of standby time before being charged again. 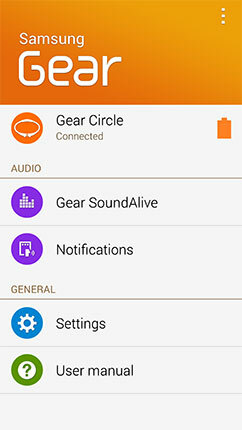 *You can monitor your Gear Circle battery life with the Samsung Gear application on your connected mobile device. *Battery power consumption depends on factors such as network configuration, wireless service provider, signal strength, operating temperature, features selected, vibrate mode, backlight settings, browser use, frequency of calls and voice, data, and other applications' usage patterns. 3. The icon next to the name of your Gear Circle indicates the device's charging level. The icon shown indicates a fully charged battery. Gear Circle: How do I charge my Samsung Gear™ Circle?